Tobacco's Last Gasp? 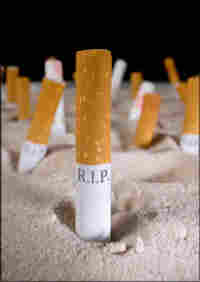 : Shots - Health News It never fails to shock us when a tobacco exec talks about the dangers of smoking their products. A bill giving FDA the power to regulate tobacco just passed its last Congressional hurdle this afternoon, 45 years after the Surgeon General warned us that smoking is bad for us and 15 years after tobacco execs told Congress their products were not addictive. The execs have since changed their tune. Still, it never fails to shock when you hear a tobacco exec talk about the dangers of its products and why they still sell them, says NPR's Joanne Silberner, so we've got some bonus audio for you that didn't make it into her story earlier this week.